Construction and demolition (C&D) waste is a central component of the solid waste stream, amounting to roughly 25 percent of total solid waste nationally. 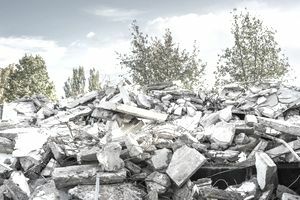 The largest part of C&D material is concrete, which encompasses around 70 percent of C&D generated material before recycling, according to the U.S. EPA. Construction (21.7 million tons) and demolition (353.6 million tons) activities accounted for over 375 million tons of material in total. Road and bridge demolition generated 157.4 million tons of this amount. Over 140 million tons of concrete are recycled annually, according to the Construction & Demolition Recycling Association. With pressure on landfills continuing to mount, the diversion of C&D materials in general, and concrete, in particular, remains an import area of interest to policymakers. For industry, there are also significant incentives. One source lists C&D tipping costs at $100 per ton, and related freight charges moving material to the landfill at $0.25 per mile/ton. Sources of clean aggregate include building foundations, curb and gutter, roads, highways, airport runways and more. Aggregate base course (road base) The largest application of recycled concrete aggregate (RCA) is for the aggregate base course in road construction. This term refers to the center layer of the roadbed. A cross-section of pavement would show dirt, or subgrade, as the lowest of three levels, layered on top by aggregate base course, and finally capped on top by pavement, either concrete or asphalt. This application is widely accepted for recycled concrete by Departments of Transportation. Soil Stabilization Where soil stability is at issue, the load-bearing capacity of that sub-grade can be improved through the incorporation of recycled aggregate, lime or fly ash. The process changes the water susceptibility of subgrade, thereby increasing stability. Pipe bedding Recycled concrete can serve as a stable bed or firm foundation in which to lay underground utilities. Landscape Materials Recycled concrete has been used in various landscape settings, including paving stones, boulder/stacked rock walls, underpass abutment structures, erosion structures, water features, retaining walls, and other uses. Processing begins with primary jaws, cones and large impactors designed to reduce concrete debris in size. This step may or may not be followed by the use of secondary cone or impactors for further processing. Dirt and foreign particulate may be removed by a scalping screen while the fine material may be removed with a fine hard deck screen. Water floatation, hand picking, air separators, and electromagnetic separators are used to ensure the recycled concrete is free of metal, clay, wood, dirt, plastic and organic materials. For more information on concrete recycling, visit the CDRA website.